If you can take on 10, 20, 50 or more lawns in 2016 - watch this video! 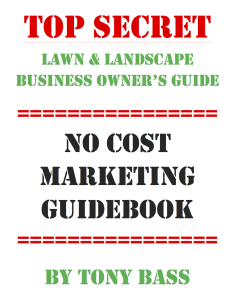 If you can take on 10, 20, 50, or more lawns in 2016 that's good news! Please watch the video above. I have a special message for you. Please accept my apologies in advance for the times I get distracted. I was super short on time this week and had to shoot the video from my car instead of the recording studio. Make sure you start using these NO COST marketing strategies in 2016. I'll be covering the details on Friday's webinar. 100% satisfaction guaranteed! This online webinar training is NOT FREE. You'll have to pay to gain access. But one thing is for sure... once you learn these 6 or 7 techniques - you'll be able to add 10 or 20 or 50 or more accounts EVERY YEAR for the rest of your life. This is going to put thousands of dollars in your bank account... that is... if you want it. Are fun to work for! ...and more. Use the promo code "nocost" when you register and get $100 off the price of this training and I'll send you 3 HUGE gifts valued at $291. Looking forward to helping you put more money in your pocket using these NO COST marketing techniques! PS - all of our training products come with a 60-day Money Back Guarantee. Copyright©2018 Tony Bass Consulting. All Rights Reserved.